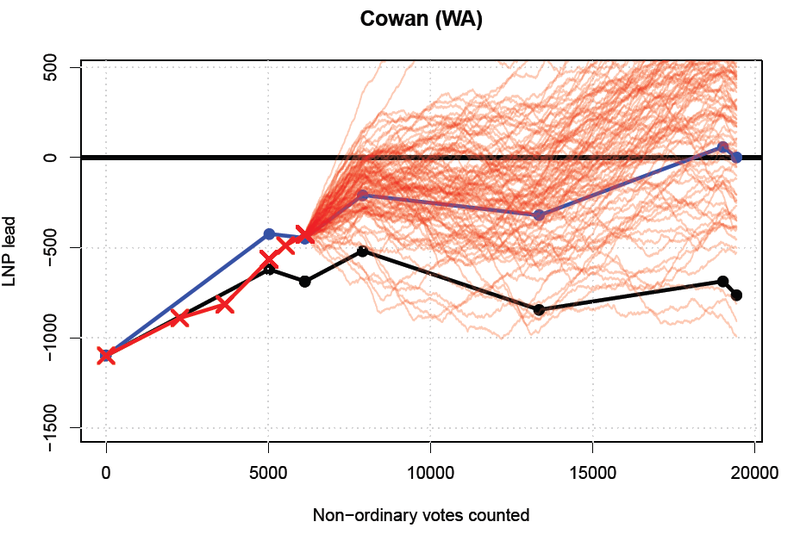 In my last post, I'd all but assumed Cowan would go to Labor, but in a completely unexpected twist the first absent votes have swung more to the Libs than even the postal votes. My model's now predicting it as more-likely-than-not a Coalition victory, and this is a quite conservative model as it assumes different non-ordinary vote types (e.g. absent and postal votes) will swing together. If this early trend in absent votes isn't just a fluke, it could be a very comfortable LNP victory despite being marked as a probable Labor win by analysts. That would mean if Herbert and Flynn fall to the LNP as expected (by me, but I could easily be wrong again! ), their promising Capricornia results continue on, Forde goes their way as also expected by analysts, and absent votes get them over the line in Cowan - 78 seats is now looking, if not likely, then at least far more feasible than it did last night.